As subscriber you can order Magic Sharpener with 20% discount. Use this tutorial to learn how to operate with plugin and get the best results. Using this tutorial you can see how you can attach Adobe-compatible plugins to Corel (JASC) Paint Shop Pro. 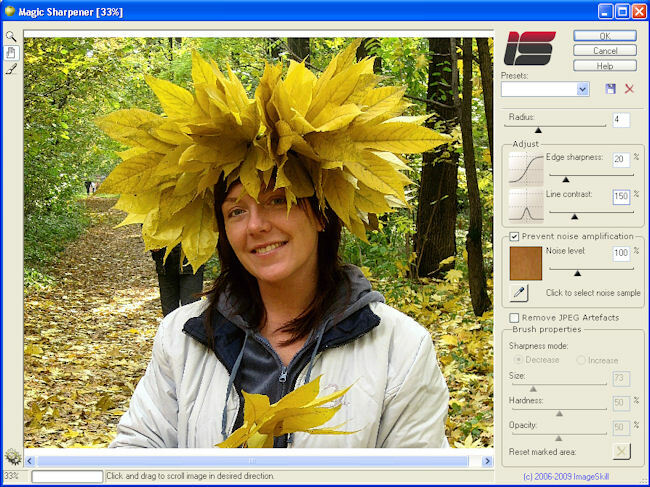 ImageSkill Software has updated of ImageSkill Magic Sharpener amazing plug-in to v.2.0 for Windows. It allows a user to get a dramatically improved look of images by perceived sharpness enhancement without increasing color halos and noise. This plug-in increases the contrast along edges and gets more sharpness and contrast to fine details, making them more visible. These latter features can be managed independently, making sharpness enhancement to be content-sensitive in some sense. Since sharpness increasing is a very creative process in which one tries to satisfy demands that in general contradict each other, the separate processing of edges and fine details gives everyone an unbelievably easy way to realize his own flight of fancy. The plug-in is additionally supplied with a new brushed selective sharpening function. These are the main features that differ this plug-in from competitive ones. The plug-in has a stylish user-friendly intuitive multi-lingual interface. ImageSkill Magic Sharpener is compatible with Adobe Photoshop and Photoshop Elements, Corel (Jasc) Paint Shop Pro, Corel Painter, Corel Photo-Paint and Microsoft Digital Image Suite. ImageSkill Magic Sharpener runs on Microsoft Windows 2000/XP/NT/Vista. 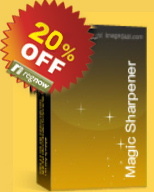 The full version of ImageSkill Magic Sharpener is available for $29.95 including VAT. Copyright Â© 2006-2009 ImageSkill Software. All rights reserved.